Debadged besides the Z71 Stickers...Thinking about taking that off too....Blacked out the bowties and smoked out the brake lights. My 2014 with 37k miles is currently in the shop for a stuck lifter. It's been in the shop since Thursday May 24th. Service department called me Friday May 25th and said that indeed a lifter is stick and that they have to have the manifold in order to fix it but it's on "BACKORDER" so to me that might mean something as far as these years of trucks do in fact have a known issue with the AFM causing whichever lifter 1, 3, 5 and 7 to not reengage once you come from V4 to V8. Awaiting a call back today to see if they have a timeframe for when the part will be in. In the meantime they gave me loaner a nice 2018 Crew Cab LTZ lol....It sure seems tho that this truck is smaller inside the cab not as much room in the backseat. I looked it up and the wheel base is about 10inches shorter than my 2014. Had this same thing happen to my 2014 5.3 LT Z71 with less than 37k miles on it. Happened to me yesterday. CEL Flashing with the Stabiltrak light solid. Start ticking even while pressing the gas. Rough idle and just running and sounding like dog crap! Called and scheduled a service appointment on it today for tomorrow at 7am. My code reader just showed P0300. Will update on what I find out over the next few days. Really disappointing tho. Almost want to just fix it and then sell it!!! Looks like this is a pretty common thing with these 5.3 V8 trucks. Mine did this exact same thing just lastnight. I just bought the truck a month ago with only 36k miles. 2014 LT. Luckily I have a back up vehicle to drive cause it sounds like dog crap! It threw code PO300 which is a misfire of course. But I've been reading that most common cylinder is the 7 with a stuck lifter. Hopefully its covered under the powertrain warranty the truck still has and I'm not out of pocket!!!! Not very happy at all!! 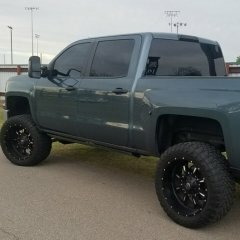 2014 Z71 LT 6" Pro Comp Lift 35" Fuel Tires and Fuel 22" rims.